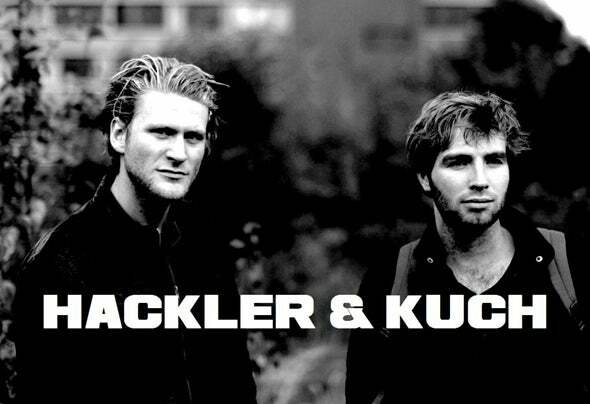 Known for their loud, dark, and deep productions, Hackler & Kuch are to be reckoned as one of the more daring Dutch-based Techno producers. Hackler & Kuch, real names Bo Andrée and Ernst vd Berg, started their ‘HK’ project to showcase a different sound than the typical clean ableton-techno. Using a combination of old analogue machines with old forgotten softwares and new modern software, they try to bring forth a unique sound that has both the feeling and characteristics of old techno and the raw power of modern Techno. Their first full album ‘Beethoven was deaf too!’ was released at US based Machine Box Records. After that they quickly made their way to other labels such as Rome’s The-Zone Records, where they released their well received Duck & Cover EP, which included remixes from Austria’s Niereich, Italy’s Logotech and Germany based Cortechs. More recently they released their Trans Lunar Injection EP, with co-producer and friend Niereich at Berlin based Nachtstrom Schallplatten. Including remixes from Japan’s grande Ryuji Takeuchi, TK-Records owner Torsten Kanzler, Michael Schwarz and Brian Burger. At the moment, January 2012, Hackler & Kuch have their works released at Nachtstrom Schallplatten, TK Records, Construct Rhythm, Rewashed LTD, The- Zone, Tanz Factory, Gobsmacked, Transmissions, Machine Box, Unofficial Records, Criminal R3cords and Hello Japan. More works are mainly scheduled at Construct Rythm, owned by German legend Andreas Kraemer, Mechno, and Machine box. Additionally they will continue to collaborate with Niereich.